In this era of concern about invasive species, people spend a lot of time and effort warning against moving plants and animals around too much. Except for trout. We move them around like crazy. 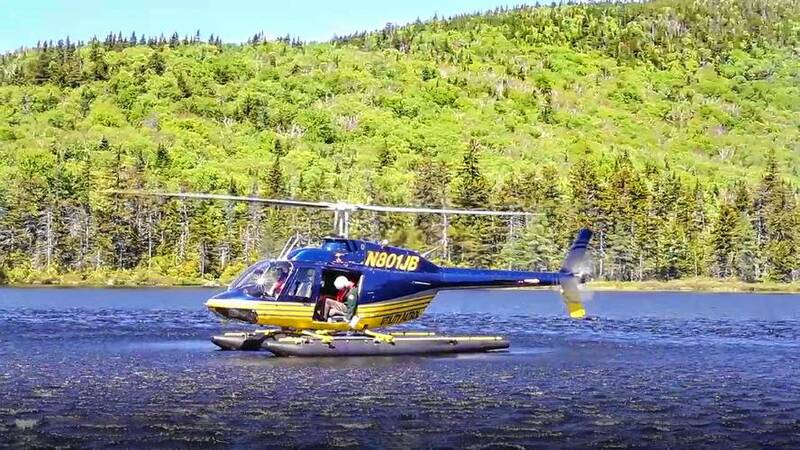 Last week the New Hampshire Fish and Game Department completed aerial stocking of remote ponds, dropping carefully calculated numbers of Eastern brook trout fingerlings from a helicopter into almost 50 water bodies around the state from the Sunapee region all the way up to Pittsburg. These young fish, roughly 2½ inches long, were hatched around February in one of the six state-owned fish hatcheries. New Hampshire, like many states, has lugged fish into ponds and lakes for many, many decades. The state used to stock ponds with trout carted in by hand from the nearest road (that’s still done in at least one pond where aerial stocking wouldn’t work), then we dropped them from airplanes, and then we switched to choppers. “Using the helicopter predates my employment here, and I’ve been here 43 years,” said Jason Smith, chief of the state’s Inland Fisheries department. The impetus for the effort is, of course, fishing. For reasons that escape me – I don’t know one end of a fly rod from the other – plenty of people just love to stand around for hours at a time, swatting bugs and trying to outsmart gill-bearing aquatic animals that lack limbs with digits (Wikipedia’s definition; isn’t it great?). New Hampshire sells about 150,000 fishing licenses each year, generating a little over $6.2 million last year. The number fluctuates by a few percentage points from year to year but has stayed pretty stable for at least a decade. Compare this to hunting licenses. The state sells only about 60,000 of those annually, just 40 percent of the number of fishing licenses. Further, the number of hunters has been declining for decades, although it seems to have mostly leveled off in New Hampshire in recent years, whereas the number of people who want to go fishing has stayed much more constant. This is great for sporting, but what about from an environment point of view? Is it a good idea to artificially raise millions of creatures and spread them hither and yon? My take is that no, this isn’t a good idea, but also yes, because it’s too late to try to keep things in their natural state. Putting fish in remote ponds, compared to places like tributaries of the Merrimack River, has one big advantage. Because remote ponds have fewer of the predators found elsewhere, notably large-mouth bass and pickerel, smaller and younger trout can be stocked. This lets them grow and adapt to the local conditions and raises the possibility that some really big trout are waiting to match wits with your lures. Fish stocked last June will have reached 5 to 6 inches in most areas, with 2-year-olds reaching 8 inches or more and 3-year-olds often reaching 10 or more inches. In a perfect world we’d rather leave the ponds alone so the ecosystem could develop naturally. But the world isn’t perfect, is it? Throughout the U.S., we have been been stocking rivers and lakes for a century or more with introduced fish, particularly rainbow trout, which is native to northern California. Because many trout species interbreed, that means we can no longer be sure what’s natural and what isn’t. Eastern brook trout are native to New Hampshire – they are the state fish, after all – but Smith says there’s wiggle room in that declaration. “We’re very careful not to call wild brook trout as ‘native brook trout,’ ” said Smith. If some non-native trout were placed in a pond 30 years ago, then the “native” trout we see there now may not be genetically pure. And it’s quite possible that non-native trout were introduced because humans have been moving fish from place to place for a long time. I know of at least one research project hunting brook trout in the tiniest of overlooked New Hampshire streams and taking DNA samples to see how many, if any, truly native brook trout are left. The biologists at Fish & Game are aware of all this, of course, and are trying to limit future damage, even if we can’t undo past errors. A few ponds and streams in New Hampshire are managed for wild trout, meaning there’s no stocking and special fishing regulations are in place. The whole issue is part of a bigger discussion about what is natural in ecosystems. In most of the world, certainly in a long-developed region like the northeast U.S., many people (including me) argue that there is no “nature” any more because everything has been too altered by human activity. If you accept this point of view, it means the best environmental practice may not be to leave things in their “natural state” because there is no natural state any more. We have no choice but to interfere. That interference might involve staying away – such as, for example, not replacing the decrepit Thoreau Falls footbridge in the Pemigewasset Wilderness – but it might require active intervention, such as lighting controlled wildfires to maintain certain types of ecosystems. There’s no easy way to tell. As unnatural as it is, dropping thousands of fish from a helicopter might actually be a good way to maintain a natural-seeming balance.